Snoring can be caused by several causes (bad nasal partition, polypi, overweight etc. ), therefore it is necessary to perform detailed ORL examination to determine its cause. If a finding at soft palate margin is concerned, laser surgery is recommended. It is an out- patient non-bloody, approx. 10-minut procedure which does not require sick leave. Pain feelings after surgery are the most frequently compared to severe tonsillitis. Their duration is individual (approx. 1 – 2 weeks), and for this period patient must adjust his/her eating habits and consume soft meals. Therefore majority of patients loose 5 – 7 kg after the surgery. Contrary to what most of patient think, the main purpose of this surgery is not only the removal of unpleasant sound phenomenon, but management of health problems which snoring people suffer from. That is, in moment when snoring person stops breathing (so called apnoic pauses) brain is insufficiently supplied with oxygen. Many difficulties are associated with that, because all-night snoring results in feeling of tiredness during a day and such persons tends to fall asleep. People with sleep of poor quality do not refresh adequately even after many hours of sleep. In rare cases even myocardial infarction can occur. 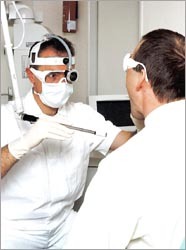 In more than 90% of fairly indicated patients only one procedure is sufficient to achieve an effective result. If it’s necessary to raise the whole soft palate, not only the margin, we use world innovation in ENT – radiofrequency induction thermotherapy (RFIT). This method has widely increased the possibilities of treatment of snoring, chronic colds and above average sized tonsils. By establishing a probe into the specific organ it is possible, within a few tens of seconds, a radiosignal transforms at a temperature of a maximum of 80 degrees Celsius and in the following six weeks a gradual absorption of the thermally treated tissue occurs and allows even a considerable decrease in size at the applied place. The entire process is programmed so that the place of application and its surroundings is not overheated. Post-operative dyscomfort lasts about 3-4 days. It’s necessary to repeat RFIT treatment after 6 weeks. The efficacy of this method is cca 80%. The price for the treatment is 8000,- CZK, first appointment with consultation and inspection 1000,- CZK.